Everyone has that familiar tin of mixed beans in the cupboard that stare you in the face every time you open the door. What to do with them…? No mixed bean salad here, just a delicious recipe for a veggie burger. No promises that everyone in your household are going to enjoy these or even taste one (you know who I am talking about…Gordy) but Yale and I had them for dinner last night with purple potatoes and a dollop of honey mustard that I made by mixing dijon, some buckwheat honey and a dash of cayenne pepper and all of a sudden your can of mixed beans is not ordinary any more. This recipe makes 8 patties. Rinse beans well in colander under cold running water. Heat a skillet and saute the onion and garlic until translucent. Add the carrot, parsnip, chili powder, cumin, salt and cook until the carrot and parsnip is tender. Turn off the heat and set aside. Mash the beans in a large bowl. Add the carrot and parsnip mixture, mustard, ketchup, soy sauce and oats. Place patties in the fridge for 15 minutes so they become firm. Heat a nonstick skillet and coat with coconut oil. Place patties on parchment lined cookie sheet, (You can prepare up to this point in advance). Bake in the oven for 20 to 30 minutes until hot. These veggie burgers freeze well. I have made vegetarian burgers before but never thought to make them mini and since Gordy loves anythingburger I thought I could pass these mini burger off without questions. Boy was I wrong. Before he even tasted one the competition was on. Gordy made his with wagu beef, American cheese, ketchup and pickles. Mine are made with black beans, oatmeal, organic ketchup and a dollop of dijon. Surprise, surprise, Gordy told me he really liked the black bean burgers, but ate all the the wagu burgers! I tried. Mini anything is fun! You just need to know when to stop eating them! My mini black bean burgers. This is Gordy’s mini made with wagu beef. This recipe make about 12 mini burgers. In a large saute pan and a bit of oil and saute onions in oil for 2 minutes. Add garlic; cook for 1 minute. Stir in the carrot, chili powder and cumin; cook 2 minutes longer or until carrot is tender. Remove from the heat; set aside. In a food processor add the black beans, oats, mustard, soy sauce, ketchup, pepper and carrot mixture; process until all ingredients are well blended. Add a bit of oil to your saute pan and add patties and cook of each side until lightly browned. Then place on cookies sheet and heat in the oven for 10 to 15 minutes or until they are slightly crispy on the outside and soft in the inside. Serve on buns with lettuce and dijon mustard or whatever topping you enjoy. 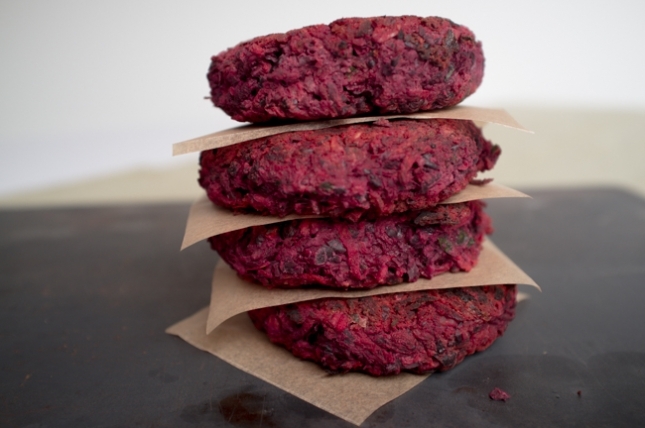 After the long weekend of eating BBQ it is time to shake things up with some veggie burgers! I think that homemade veggie burgers are always better than store-bought and these are easy to make, just remember that for this recipe you need to soak the millet overnight. Oh, and in case you were just wondering Gordy did not eat these burgers, he had shrimp. This recipe was adapted from my new book that Yale gave me for Mother’s Day, The Beauty Detox Solution. Rinse and soak the millet in water overnight before preparing the burgers. When you are ready to make the burgers add the millet to boiling water, reduce heat to a simmer and cook for about 15 minutes until the millet is soft. When millet is ready let cool. Sauté the garlic and onion in 1 tbsp of oil until the onions are translucent. Add the swiss chard, celery, and carrots and cook for a few minutes, then mix in the sea salt and additional seasonings. Add the cooked millet and stir well. Take pan off the heat and add the amaranth flour to the mixture. When the mixture has cooled form into small round burgers. When ready to eat heat a large pan and add oil. Cook each burger on both side until golden brown. I am married to a burger lover – I did try to pass these off one night for dinner but I have to be honest they did not go over well , but what can I say I Ioved these burgers and will be making them again. 1. In a small sauce pan, toast the quinoa in olive oil for a few minutes. Add a cup of water and a pinch of salt, cover, and cook until the water is absorbed (about 15 minutes). 2. Put the black beans, cooked quinoa, corn meal or oats, onion, garlic, chili powder, cumin, hot sauce, tomato paste and salt into a mixing bowl. Mix everything together with your hands until it’s evenly mixed. 3.Divide the burger mixture into four equal pieces. Use your hands to form the burgers. 4. Preheat a heavy-bottomed pan over medium-high heat. Pour some olive oil into the pan. Cook the patties for 5 minutes on each side, until they are a deep brown.